Remodeling your kitchen can be one of the most difficult, and expensive, home remodeling projects you can undertake. Choosing the right cabinetry and how the room should flow are difficult enough without the manual labor it takes to actually get something done. Master carpenter and premier Tampa kitchen restoration specialist Don A. Sigel can help you navigate this daunting and intimidating project. Refresh your kitchen with sleek and modern cabinetry, flooring and appliances that incorporates the latest in kitchen designs while increasing the functionality of your space. Not only does Tampa carpenter Don A. Sigel of DAS Studio have a keen eye for designing a new kitchen, he also builds new custom cabinets whose design will not only give your kitchen a fascinating new look, but maximize what is already a rare commodity in many houses – space. See some prior kitchen remodeling projects spearheaded by Don below and learn more about how he transforms an ordinary kitchen into a stirring atmosphere to entertain family and friends. Need an estimate or have questions about kitchen remodeling? Contact Tampa master carpenter Don A. Sigel today for more information. 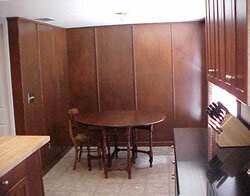 This is a complete kitchen remodeling project. Don gutted and drywalled the kitchen. He textured and finished the interior walls. Don also designed and installed the cabinets. The kitchen counter was fitted with black absolute granite tops. Butcher block island with wine rack was built at the center. The dining area has maple panel with solid hard maple baton strip. The kitchen cabinets and countertops are designed to blend in beautifully with this dining area. Original photos of a kitchen in a fixer-upper home. This kitchen is completely remodeled. 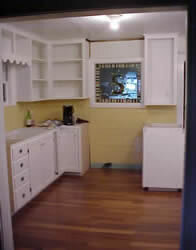 All cabinets and floorings were removed, walls repainted. The water heater was relocated to a laundry room. Original sink base, standing in a pool of stagnant water, was removed. The room where the sink base stood was remodeled to be a cozy family dining room. Old carpet was removed and replaced by Mexican Saltillo tiles. New place for the sink base; Don redesigned and installed this new kitchen cabinets for the homeowners. Original vinyl floorings were removed and replaced with exotic tiles. New appliances i.e. stove and fridge are installed. Left: For functionality, Don designed and installed a small pantry unit next to and over the new fridge. Right: An almost complete kitchen installation. View of the base cabinets and upper cabinets. 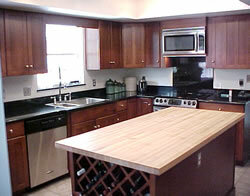 The challenging parts of the kitchen remodeling were the whole kitchen redesign and the installation. Walls were "irregular" making installation more complicated. Finished photos are coming soon.